Why do we go to readings? To hear an author’s words in their own voice. To discover new contexts, new stories, and new ways of reading stories we already love. Perhaps most of all, to experience that delightful alchemy when several authors who’ve never met before come together, and the chemistry is palpable. The best readings, I find, are those where the whole becomes more than the sum of their parts, and the joyous reading “Three Writers, Numerous Countries” at LASALLE College of the Arts on 13 March was one such occasion. Seema Punwani kicked things off with a warm, funny reading of two chapters from her debut novel Cross Connection. We were treated to a recount of the main characters’ first meeting from female protagonist Sama’s point of view, and then from male protagonist’s Zehn’s, where in a slyly done sleight-of-hand we discover that what Sama remembers as their first meeting was in fact their second—as Zehn recalls. 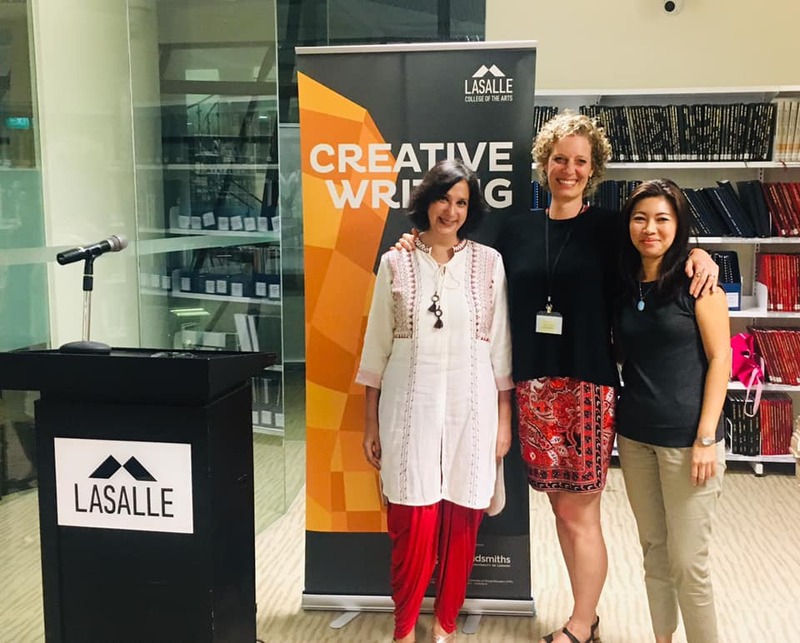 Dr Angie Abdou, visiting Artist in Residence for the week at LASALLE, took the stage to share with us her creative nonfiction as well as fiction, reading from her memoir Home Ice and latest novel In Case I Go. It’s a testament to the universality of good writing that these two very different and very Canadian stories—the true story of a year in Angie’s life as an ice hockey mom, and the story of a young boy and the Ktunaxa girl next door who are haunted by the misdeeds of their ancestors—captured the attention of this room of Singaporean listeners, half a world away from Canada. Themes of family, of parenthood, of how one makes sense of the world we live in in the present when we can’t quite shake off the past, proved to resonate beyond geographical boundaries. 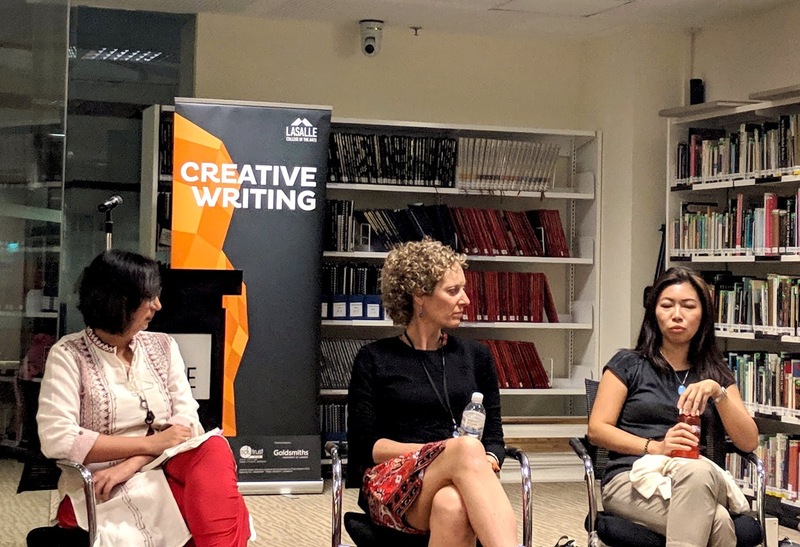 Grace Chia, aided gamely by LASALLE MA Creative Writing Programme Leader Dr Darryl Whetter with the dialogue, then read her searing short story “Berries and Weeds” from the collection Every Moving Thing That Lives Shall Be Food. There was a serendipitous connection with Canada in this story, about a Singaporean girl who travels to Canada to meet a long-distance penpal turned lover, only to find that she grows up on this trip in ways she hadn’t expected. “I was leaving. He had left.” Of all the gripping, memorable lines in Grace’s story, these two simple sentences were the ones that stuck with me the most. Intentionally or otherwise, it seemed to me that all the stories read that night shared a common thread of poignant curiosity about human connection: how we make connections, break them, long for them, fantasise about them and come back to reality to find that what we have is very different. But this reality is what we have, and that means something. During the spirited, collegial Q&A, Grace raised the point that all three authors were mothers, kicking off a lively discussion about finding the time and headspace to be a parent and a writer at the same time. There was also a question from the audience about writing for oneself versus writing for others, and ultimately, what we write for. Seema shared that a reader had told a friend in Doha, after reading Cross Connection, “someone wrote a book about you.” “I’ve never met this friend in Doha,” said Seema—but that hadn’t stopped her from writing a book about them. Angie shared her experience with her debut novel The Bone Cage, which was selected for Canada Reads, a nationwide radio programme that catapulted the novel to public attention. The early taste of fame might have been addictive, said Angie, but ultimately an ephemeral and brittle foundation upon which to build a lifetime of writing. Her advice: to write for yourself, for that one person out there who is touched by your words and your story, and to “trust the process”. Trusting the process: that hours, minutes, pockets of time carved out daily, the slow, steady practice of putting down one word after another, will bring you to a place you didn’t even know you wanted or needed to go, and it will be the right place in the end. As Angie would share with the Masters students at fiction workshop the following night, to allow ourselves to “write into the dark” is one of the most overwhelming yet liberating things we can do as writers. It can sometimes feel incredibly solitary. So thank goodness for readings such as this one, where the camaraderie and warmth remind us that we’re not in this alone.